Get two fresh looks for your 14-14.5" dolls such as WellieWishers™, Hearts For Hearts Girls®, or other 13" to 14-1/2" dolls - one for regular school days and one for picture day! View A - Perfect for picture day at school, this dress has a sweet pin-tuck yoke with a peter pan collar. The puff sleeves are gathered onto a sleeve band and the full skirt has two tiers. View B - This dress can be made in many variations, for wearing any day of the week. It has a “bib” edged with trim, accented with a peter pan collar. The puff sleeves are gathered with elastic and the skirt is edged with a contrasting band. The PDF pattern includes instructions for two construction options - one to make your dresses “Fast and Easy” and the other to make it “Heirloom” quality. Both go together easily, and will look exactly the same on the outside. The difference is on the INSIDE. 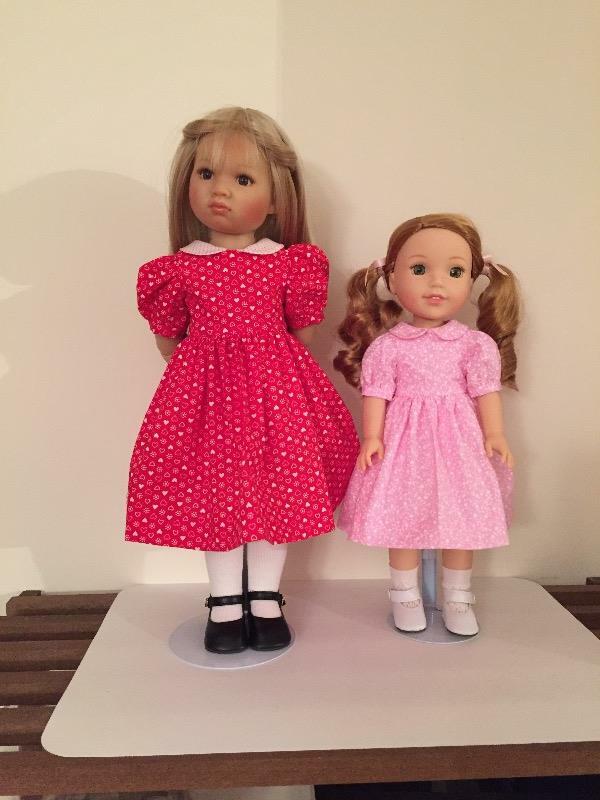 If you want to create a dress for play dolls, use the “Fast and Easy” instructions. If you want to create a dress that collectors will treasure, use the “Heirloom” instructions. The Heirloom Construction features a lined bodice finished with lace. The bodice lining is hand-stitched to the sleeve seam, and the back is finished with buttonholes or snaps. The Fast and Easy Construction dress goes together much more quickly. The bodice is lined, but the finished seams are exposed. The back closes with hook and loop tape. Complete the outfit with the Love U Bunches Plain Jane Shoes pattern for 14.5" dolls such as WellieWishers™! Don't miss the School Girl pattern for 18" dolls such as American Girl®, Kidz N Cats® and A Girl For All Time®. Recommended Fabrics: Light weight cotton fabrics. What You Get: One 41 page sewing pattern that you digitally download as a PDF file so you can start your project immediately! The PDF sewing pattern provides full color step-by-step illustrated instructions and full size pattern pieces. A PDF reader is required to view and print the files (example: Adobe Reader or Preview for MAC). The download link is received immediately after the transaction is complete. Print copies are NOT available. Wonderful pattern. Perfect fit. Love it!